1 QRPlaza Keysback - blue - the easiest way to recover your lost keys. QRPlaza Keysback is the first key chain that allows you to track your lost keys anywhere in the world and to get contact anonymously by the people who have found them to arrange a meeting for returning. We all know the hardships caused by the loss of a set of keys, which are the house, car, office, bike keys, that oblige us in many cases to the replacement of the lock. 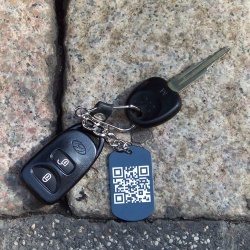 With QRPlaza technology you can always be contacted, keeping your anonymity, by the person who have found your keys. Possibility to recover lost keys. To access some QRPlaza Keysback demo please click on the link below. 2 QRPlaza Keysback - blue - the easiest way to recover your lost keys. 5 QRPlaza Keysback - blue - the easiest way to recover your lost keys.